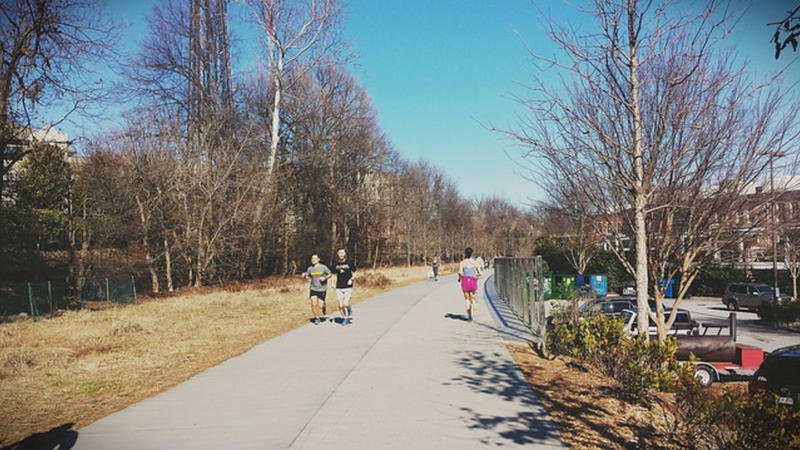 Just steps from Piedmont Park, the paved Atlanta Beltline Eastside Trail is a mecca for walkers, runners and cyclists. The trail is a total of 2.25 miles and takes you through Midtown, Inman Park and Old Fourth Ward. Consider the Atlanta Beltline’s Eastside Trail a mecca for Intown Atlantans to get in their daily dose of exercise. The 2.25 mile paved trail links the Northeast corner of Piedmont Park with Historic Old Fourth Ward Park and the Freedom Parkway trail. This urban slice of greenspace offers views of the Midtown skyline, the refurbished warehouse district of Inman Park and Old Fourth Ward, and a slew of graffiti and artist work. Starting from 10th Street and Monroe Drive, you’ll notice a slight inclined grade, but it is hardly noticeable. This is the first completed segment of the Atlanta Beltline’s railroad corridor, and the city’s non-profit Trees Atlanta is constantly beautifying the surroundings with plants and trees. 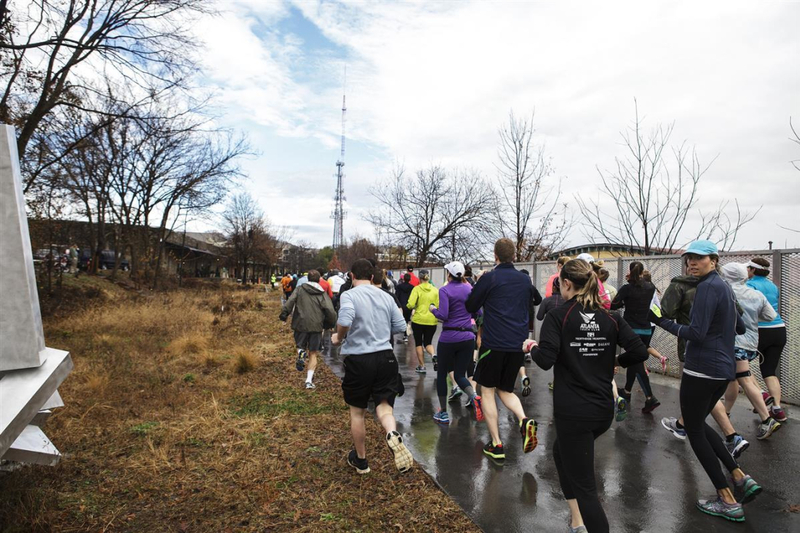 Besides its sheer convenience to the city, and traffic-free workouts, the Beltline Eastside Trail has become an outdoor path for arts and culture. Throughout the year, the Art on the Beltline series displays sculptures, inventive graffiti art on the bridges and playful art statement pieces along the path. Examples of continuing exhibits include the rusted “Railroad Warriors” near Greenwood Avenue and the “Faces and Friends” graffiti under the Highland Avenue bridge. Make a stop at the Historic Fourth Ward Park for an urban oasis in the city. Or swing by Old Fourth Ward Skatepark, donated by Tony Hawk, to watch local skateboarders practicing their latest tricks in the half pipe or bowls. The multi-use athletic field, when not busy with teams playing pick-up football or soccer, makes for a grassy place to do striders. When the weather is nice, the Beltline becomes so crowded, you’ll feel like you are moving as slow as molasses. 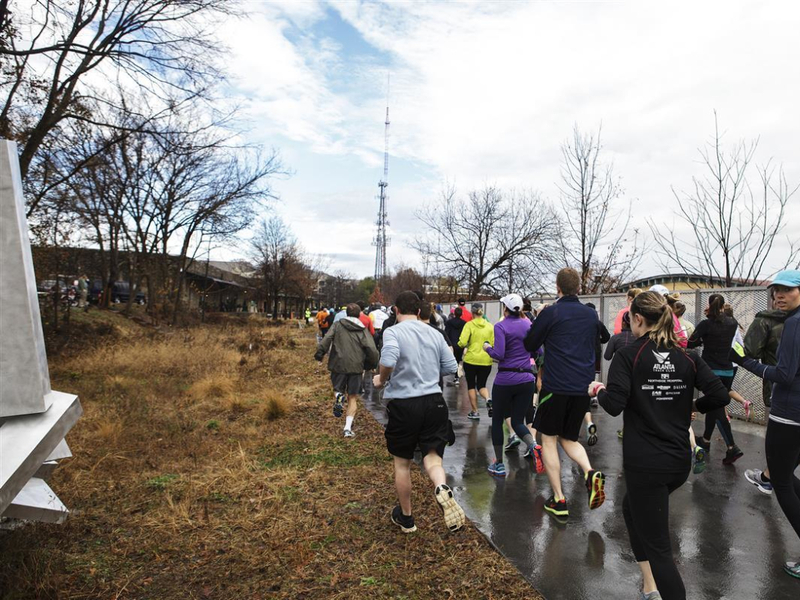 For runners, you won’t have to worry about traffic stops that get in the way of your run, making the Beltline an easy choice for tempo runs and uninterrupted “tune out” runs. Be wary of walkers, strollers and large crowds of people taking up the entire path. The Beltline is more for recreational and commuter cyclists due to the volume of people and its short distance. You can easily connect from Piedmont Park to the Freedom Parkway trail for traffic-free cycling or commuting to Atlanta’s well-known neighborhoods such as Midtown, Inman Park and Old Fourth Ward. Hit the trail early in the morning or just before sunset, you’ll be rewarded with the gleam of sun on Midtown high rises, and low traffic. For free parking, utilize the street parking on Virginia Avenue or 10th Street. On nice days, this will become crowded and you may have to pay for parking in the Park Tavern paid lot. At the South end of the trail, park along Irwin Street or Lake Avenue. Along the Beltline, you can have your pick of access points, with 9 total on the 2.25 mile stretch. These access points lead to local neighborhoods and shopping districts. For a post- workout coffee, take the exit South of Freedom Parkway to get a cup of Joe at Inman Perk. If you want a break before turning around at Irwin Street, Krog Street Market is a block South of the trail, where you can get booze from Hop City, fresh sodas from Yalla or coffee and pastries from Little Tart Bakeshop.